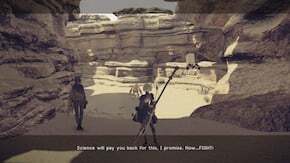 Jackass' Research is a Side Quest in NieR: Automata. "Jackass is doing research on the excitement androids experience during battle. She needs combat data on a new enemy model, so head into the desert and start wreckin' machines!" "The required data has been obtained. Apparently, the feeling of excitement experienced during combat is close to what humans call "love". Jackass is already figuring out what to do next." "Jackass seemed very surprised that a YoRHa type, being specialized in combat, was capable of regular thought. According to her, normal thoughts only get in the way when you're trying to destroy things. Jackass is already considering what to do next..."
"The required data has been obtained, and reveals that androids actually generate a pleasure-granting chemical while in combat. Jackass plans to use this knowledge to create a new drug that will expand androids' capabilities. Go see her again after some time passes." "The results of the research indicate androids generate some kind of comforting element in their circuits during combat. Jackass is going to use these results to create a new drug for expanding android functionality. Give her some time and go meet her again in a while." "The new drug was so good, those who partake of it find it hard to put down. ...Oh, and it also causes extreme mental instability. However, if you're curious, Jackass claims it can be obtained by talking to a Resistance member near the oil fields in the desert." Jackass needs more detailed data. Defeat the target machines without taking any damage! The required data has been obtained. Report to Jackass. Jackass needs even more detailed data. Defeat the target machines in 30 seconds. For the last batch of data, Jackass wants you to defeat the taget machines in 30 seconds without taking any damage! Head towards the Desert: Camp area by the Item Shop and Access Point. Jackass will be here and ask for your help. This quest unlocks after the Amusement Park has been completed. Follow Jackass and fight the enemy unit. It is a level 20 Medium Biped. Talk to Jackass to complete the quest. It unlocks a new opportunity for battle, this time against 3 Lvl 20 Medium Bipeds. You must defeat them without taking any damage. You will unlock E-Drug for your efforts. This is a pretty good time to grind XP/Gold if you&apos;re low level.